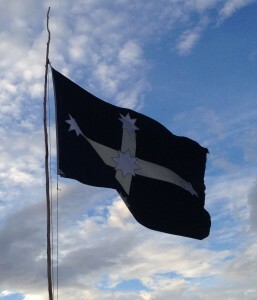 The reconstructed Eureka Flag, handcrafted by women and men of Ballarat, was raised as part of the dawn ceremonies on 3rd December 2014. Our visit to Sovereign Hill was to see a special performance of ‘Blood on the Southern Cross’, a sound and light show which tells the story of the events leading to the Eureka Stockade. The timing of the performance was significant. December 3rd 2014 was the 160th anniversary of the Eureka uprising. And the soldier attack on the miner’s stockade had taken place in the pre-dawn of December 3, 1854. Why were Jary and I there at all? We had been commissioned by the Museum of Australian Democracy at Eureka to produce some short films and multimedia content for the 160th anniversary. From Blood on the Southern Cross we went straight to the location of the Stockade itself, the Museum of Australian Democracy at Eureka where the happenings of the Stockade were commemorated in a series of events. The ceremonies started with a Smoking Ceremony and Welcome to Country led by Wathaurung Elder Uncle Bryon Powell, during which he gave special acknowledgement to Wathaurung Elder Aunty Marlene Gilson. 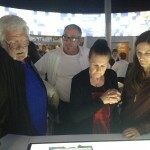 Uncle Bryon Powell and Aunty Marlene Gilson and family friend look at their content on the Museum touchtables for the first time. Jary watches on. December 3rd 2014. We had got to know Uncle Bryon and Aunty Marlene well lately as they were principle storytellers in our Eureka 160th films. After some dignitaries spoke, a reconstruction of the original Eureka flag, hand crafted by women and men of Ballarat over the last three months, was hoisted to a special flagpole. A leading flag bearer was Val D’Angri, a descendent of Anastasia Withers, said to have made the original flag. Val also happens to be the extraordinary craftswoman who undertook the first restoration of the original Eureka flag in 1973. We had got to know Val as well through telling her story for the Eureka 160th films. At 8am the digital stories, four of which Jary and I had produced (and we were by no means the only film makers involved!) were launched. 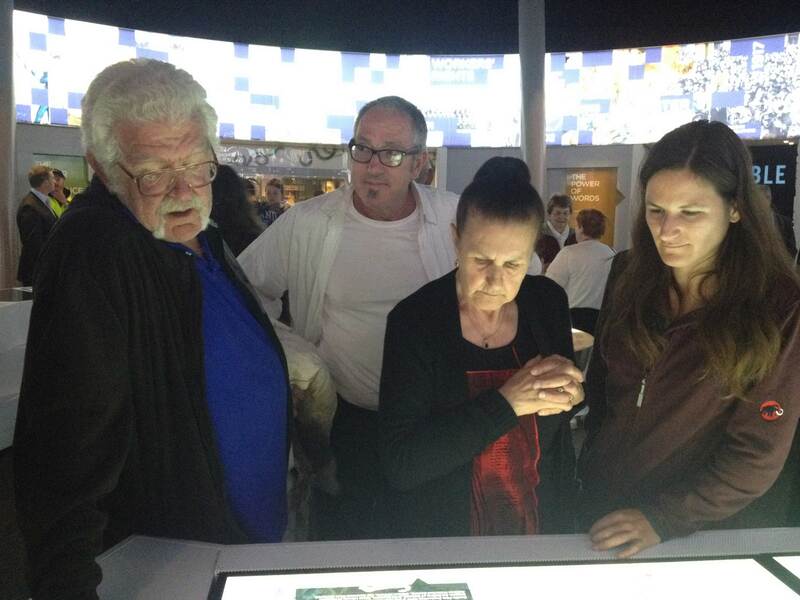 A highlight of the morning was to be there to see Aunty Marlene and Uncle Bryon explore their digital stories on the Museum touch tables for the first time. From Ballarat to Melbourne to see the culmination of a project Jary and I had begun work on five years ago. In 2010 I was contracted to help David Scott turn his autobiography, a huge 200,000+ word monster of a manuscript covering the Great Depression, World War 2, the Indonesian invasion of East Timor, some of Melbourne’s most significant welfare organisations: Community Aid Abroad and the Brotherhood of St Laurence; and the beginnings of government environmental policy, into a 65,000 word publishable book. David was a quiet, enthusiastic, shy man and it was a pleasure to know him. We started breaking his book down into themes and chapters, and we started to carve out the important parts, regretfully discarding material, and editing down some of his material into smaller chapters. The book ‘Always Say Yes’ is launched. Lucinda co-authored the final chapter and did much research for the whole book. December 3 2014. Sadly David became ill, making it difficult for him to work collaboratively on his book. My involvement in the project ended then for a while, though David’s friends continued to work on his book with him. David died in 2012 aged 86. From then David’s friends persevered with the dream of publishing the book. Murdoch Press, taken over mid-way by Allen & Unwin, agreed to publish it and a writer, Carrie Hutchinson, was commissioned to transform what had been a first person memoir into a third person biography. She did a great job. 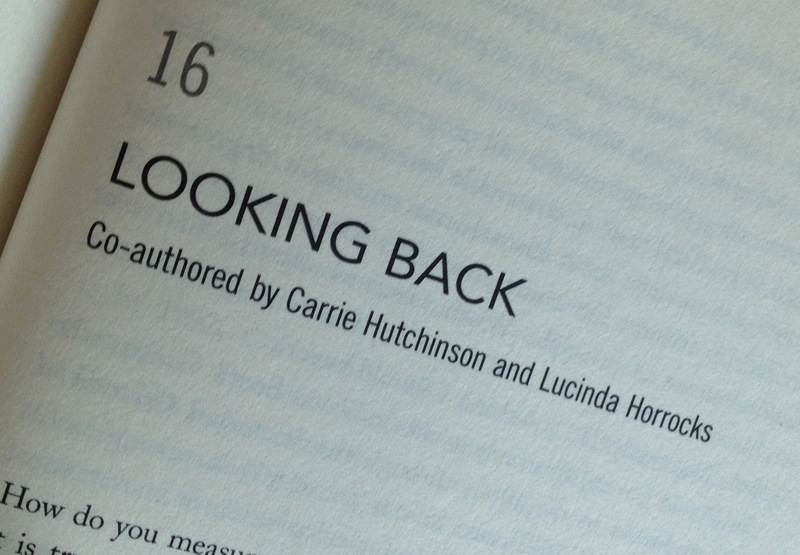 I was invited to co-author a final chapter in the book with Carrie. So the launch was a big thing. David’s friends and family were there. Mike Salvaris – one of David’s self-appointed ‘literary executors’ gave a wonderful speech acknowledging David, his life, and the long gestation of his book. Peter Hollingworth gave a moving speech about David, as he had worked with him and knew him well. Deanne Gilson’s art looks wonderful on Bunjilaka’s walls. 4 December 2014. Aunty Marlene Gilson is the central subject of one of our Eureka 160th documentary stories for MADE. Aunty Marlene is an extraordinary artist who paints stories of her ancestors, the Wadawarrung (Wathaurung) people. We grew to love Marlene and her art and it was a great honour to be invited to the opening of her joint exhibition with her daughter Deanne, a talented artist herself, and younger members of the family. 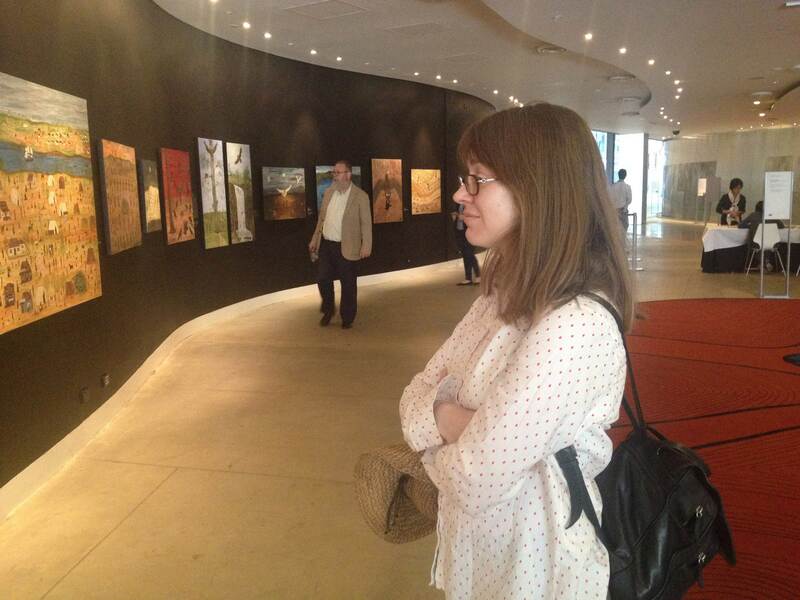 Lucinda looks at Aunty Marlene’s art. December 4th 2014. The Wadawarrung story reaches back 60,000 years, is embedded in the landscape of the place we live, and intersects with important events in the colonial and post-colonial history of Victoria: John Batman, William Buckley, the Eureka Stockade. It continually amazes us with its richness. ‘Why didn’t we know this? !”, was a constant refrain as we researched Aunty Marlene’s story. It was wonderful to be there at the launch of her and Deanne’s exhibition. 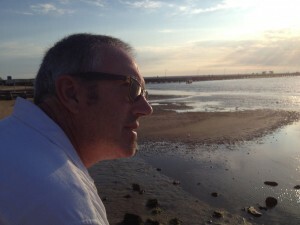 Jary looks out the bay at St Kilda in a break between engagements. December 4th 2014. 7:30pm, December 4, An Evening with Charles Dickens, Graze on Grey, Grey Street, St Kilda. 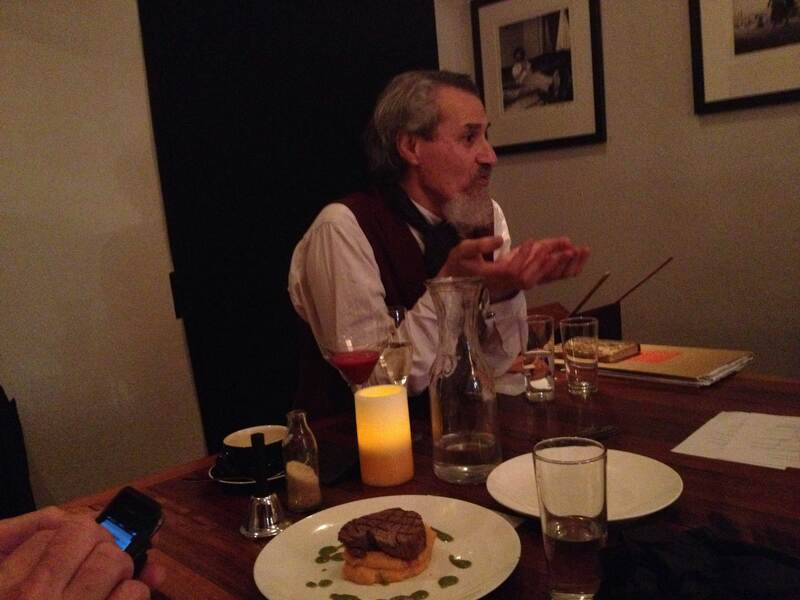 This was a dinner with some old friends and collaborators. For Jary & I, the friendships we have made whilst working on Wind & Sky Productions is the most precious thing about our work. Four years ago, we produced a series of films about a wonderful production ‘Charles Dickens Performs a Christmas Carol’. 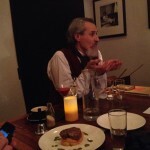 Phil Zachariah entertains the dinner guests as Mr Dickens. 4th December 2014. I think we’ve been to see almost every Dickens Christmas show since then. It was a pleasure to see Phil Zachariah in his element as Mr Dickens, presiding over a ‘Table for 18’. Phil performed some shorter readings and also chatted with the dinner guests about how he approaches his work. ‘Table for 18’ is the brainchild of Richard Mitchell and Gwendolyn DeLacey, of the Maggie Diaz Collection. It was Richard who, in his capacity as Director of Knox Community Arts Centre, engineered our introduction to Phil, to Eagles Nest Theatre and to the Dickens show. Lovely to still see them do good work. 11:00 am, December 5, Big Design Market, Royal Exhibition Building, Carlton. 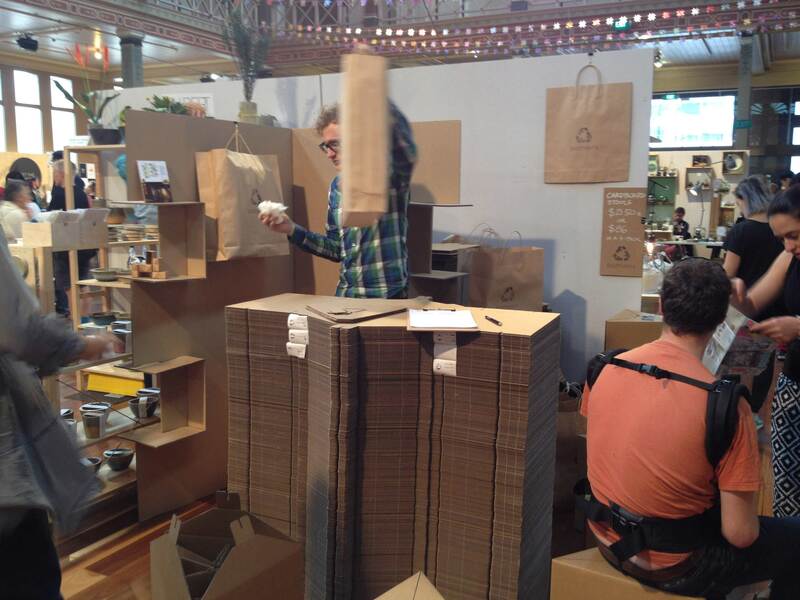 Toby Horrocks the cardboard architect at work at his pop up stall at the Big Design Market, 5th December 2014. 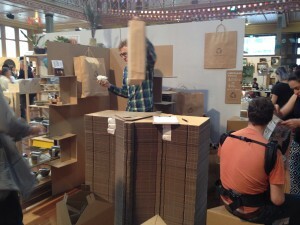 OK so this was to see my brother Tobias Horrocks’s stall – he’s a cardboard architect with his company Fold Theory. But, some years back Jary & I made a film for Toby featuring one of his cardboard shelving designs. So I’m counting this one as a Wind & Sky event. 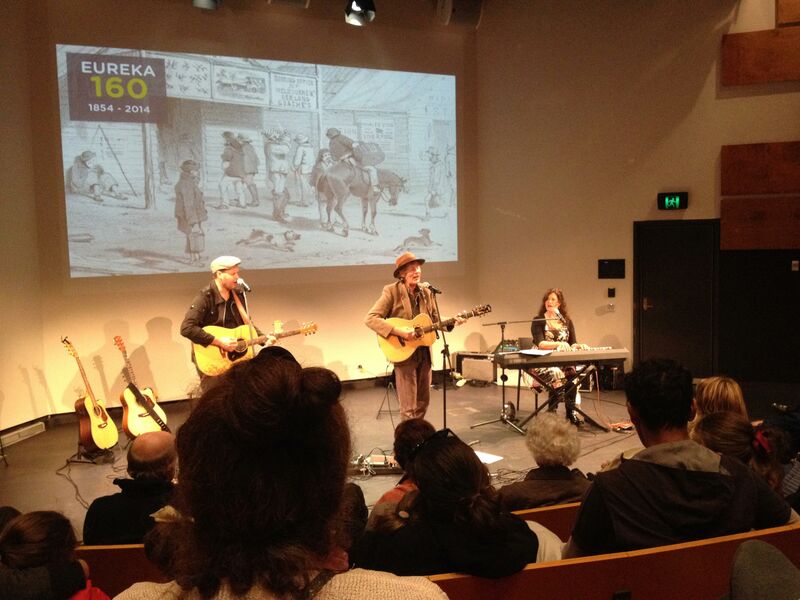 By the weekend we were back in Ballarat to see a variety of events commemorating the Eureka uprising. The conversation with Clare Wright session was a highlight, as was hearing the first performance of the commissioned piece of music ‘Eureka Then and Now’, music by Adam Simmons, Justin Hayward and Freya Hollick with Ballarat Centre of Music and Arts choir. And I got to meet the 99-year old Ella Hancock again. Ella featured in our Eureka 160th story about Patrick Howard, her grandfather. Ella is amazing to speak to. Her mother was born in 1877 and her grandparents were at the Eureka stockade. And she stuck around for the whole day. I’m pleased to say Ella approved of our story featuring her. This was a relief! 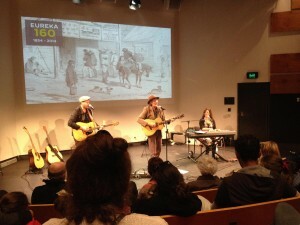 The Howard siblings perform to commemorate the events at Eureka. 6th December 2104. That Saturday evening I watched an outstanding performance of the Howard siblings – more descendants of Patrick Howard. We had interviewed Shane Howard for our Patrick Howard story as well. What a marvellous project this had been for us! On the Sunday Jary and I had to put on our best as it was our turn to be in front of the audience. 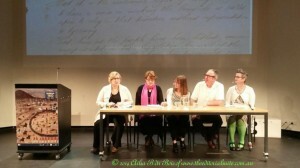 We were part of film-makers panel event about storytelling around Eureka. After the Q&A our films were shown in the MADE theatrette, along with the films of fellow producers Leslie Falkiner-Rose of Falkiner Media, and Erin McCuskey of Yum Studio. I do not look forward to public speaking events. So nervous beforehand. But in the end the panel discussion was great fun. We were the last of the events at MADE and everything had a relaxed and informal atmosphere, which worked perfectly. Jary & I managed to speak coherently on our storytelling process, we heard some great insights from our fellow panellists Leslie and Erin, and the show was skilfully facilitated by Jane Smith the Director of M.A.D.E. It was lovely to see many friendly faces in the audience, people we knew, people we had worked with on the films and people who were featured in our films. The panel discussion facilitated by Jane Smith, Director of M.A.D.E, with Leslie Falkiner-Rose, Lucinda, Jary and Erin McCuskey. 7th December 2014. Photo by Ailsa B Du Bois, the Editorial Suite. 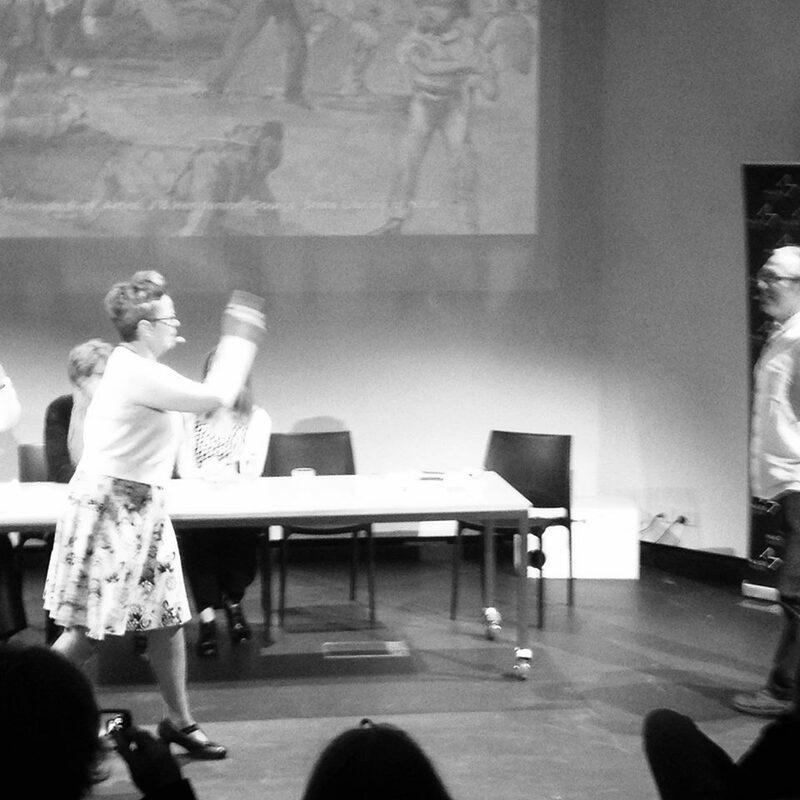 The highlight of the hour was a re-enactment of a famous 1856 horsewhipping incident when the performer Lola Montes (played by Ms Erin McCuskey) bumped into Editor Henry Seekamp (played by Mr Jary Nemo) in the street, not long after Henry had written Lola a very critical review. Lola had her whip to hand; you can imagine what happened next… It was great fun. Erin demonstrates the use of the riding whip with Jary as guinea pig. “Madam?! ?” says Jary. “Sir!? !” says Erin. Photo by Linda Franklin, 7th December 2014. The film screenings were surprisingly moving (since we’d seen the damn things so many times). I think the stories of the Indigenous experience, of reverence and wonder for the flag, of the fight for justice, were powerful. I think, I hope, no I’m sure, we did the stories proud. I’m glad we got to see them shown on the big screen. Most people will see them on the Museum touch tables, which is, in its way, a fine thing.